Sample Funeral Program Layout: What Should You Include? Before getting started creating a funeral program layout, you should decide the format of the funeral program you would like to use. These are the most commonly used format that are the basis for a good sample funeral program layout. One-sided 8 1/2 x 11" piece of paper. While printing double-sided on a single sheet of letter size paper rarely produces a nice looking funeral program, the simplicity of a single-sided sheet of paper can provide a simple but classic funeral program. Double-sided, single sheet, funeral programs can be tastefully done in most sizes smaller than 5" x 8". However, 5" x 8" and 5" x 7" are most common and provide the cleanest layout and design. Booklet-style funeral programs are the most common types. They provide a natural way to separate sections from one another and offer the cleanest design possibilities. Unless you have strong feelings about not going with a book-style funeral program, this is probably the best way to go. To use standard letter-size paper, you can choose from folding the page in half to create an approximately 4" by 6" book, or fold the page twice to create a smaller booklet. You can find blank templates for these formats in Microsoft Publisher – which is included in Office 2010 Home and Business editions and up — or other desktop publishing programs. 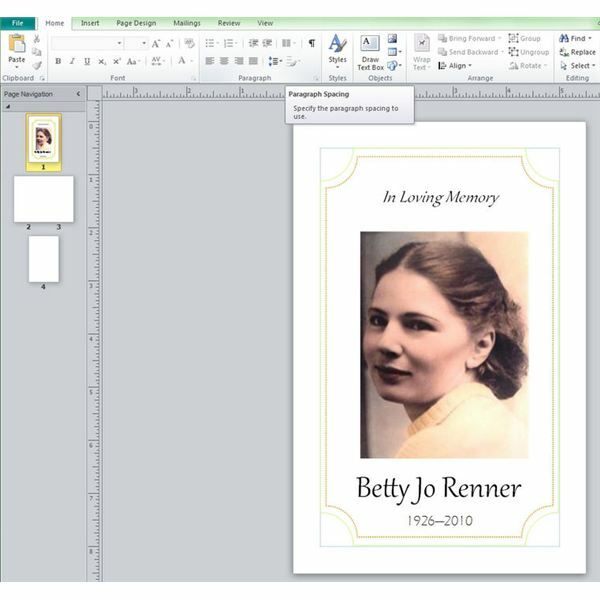 Once you have decided on a format for your funeral program it's time to plan the layout. Most programs display a photo of the deceased somewhere on the cover. In the case of a non-booklet program, there are two basic routes to go. One method is to use the person's photograph as the background with the text or lettering on top of it. While this can be a powerful and artistic layout, it introduces the added difficulty of ensuring that the placement of various text or numbers do not occur in such a way that make the picture look bad or comical in some manner. The less text used over the picture, the better. The most basic sample funeral program layout has the name of the person, dates of life, and the place and time of the service on the cover. An additional quote can be included as well. The back or inside of the program is used for additional information. For booklet formats, the left page is a good place to include an itenerary or order of events that are to occur, especially for longer or more formal funerals. The bottom of the order of service should contain information about any reception or subsequent event that occurs following the funeral. The right page is a nice place for a funeral poem or other quote or message to the mourners. For booklet style funeral programs, the back is generally left mostly blank, however, consider this location for a simple "goodbye". Some of the best good-byes are those that can be read in such a way as to apply to both the deceased and those who attended the funeral. A simple, "Until we meet again," is a nice touch and can mean whatever the reader would want it to mean. 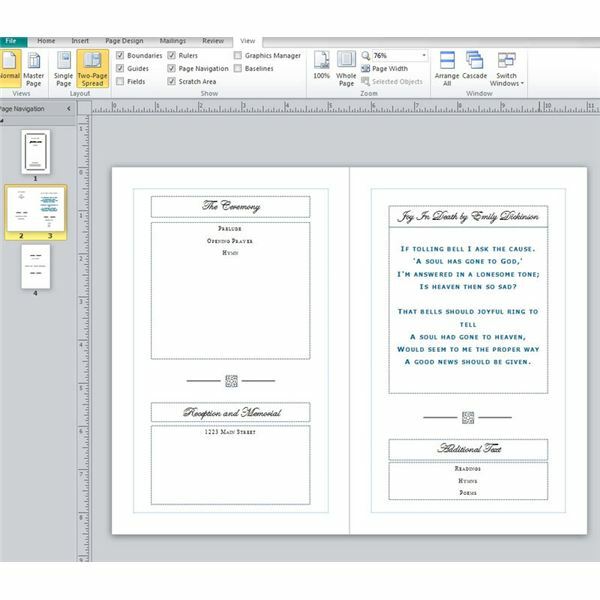 Screenshot of Microsoft Publisher file created by author.